Fill dirt is typically used to fill in holes and depressions in order to level out uneven ground. Fill dirt is made up of the level directly below topsoil, known as subsoil, and lacks the nutrient organic matter found in topsoil. Generally, fill dirt is excavated from construction sites where soil needed to be moved for building. Fill dirt is not the same thing as topsoil. Topsoil is a poor filler for holes because the organic matter will decompose overtime, causing portions dirt to sink and the surface to become unleveled. Names: Fill dirt, screened dirt, unscreened dirt, clean fill dirt, subsoil, and pond fill. Description: Generally, fill dirt is excavated from construction sites where soil needed to be moved for building. Fill dirt is not the same thing as topsoil. Delivery: We are able to deliver all bulk material, dirt, topsoil, landscape ties, mulch and decorative stone to NJ, PA & NY. Delivery charges are a function of the type of materials, the volume of materials, as well as the distance (from our Pennington, NJ location) to your site. Please phone us and we can discuss the particulars of your needs. 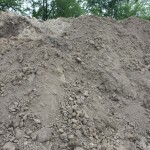 For more information about pricing and delivery of dirt, please contact us. Gregs Landscaping supplies dirtBulk delivery of dirt is available in New Jersey, Pennsylvania, and New York. Free delivery for qualifying orders*.